The CORE Group Fall 2017 Global Health Practitioner Conference brought together representatives of CORE Group Member and Associate Organizations and other community-focused global health practitioners, policy makers, researchers, private sector partners, and donors. 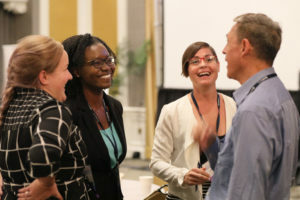 Attendees exchanged and learned about community health approaches and good practices, connected with their global health peers, and strategized on joint efforts in Working Groups. The Conference drew 261 participants from over 20 countries representing 74 organizations and 8 universities. An additional 40 remote participants from around the world joined in the live broadcasts of the keynote and plenaries. Through the conference theme of “Collaborating for Health Communities: Results, Realities, and Opportunities,” participants identified and discussed results of collaborative action for community health; challenged realities of operations research, program approaches, and changing environments; and explored opportunities for new partnerships and emerging voices for building healthy communities worldwide. Gender and other social normative changes influence behavioral outcomes of health programs, yet such normative shifts are difficult to define operationally, let alone measure. Often, our work is implicitly focused on normative change; how can it be more explicit? How can we design normative change interventions to be scalable from the start – to reach more communities and achieve greater impact? This workshop drew from work of the USAID-supported Passages Project and the Bill and Melinda Gates Foundation-supported Social Norms Learning Collaborative. Both aim to advance theory, practice, and measurement of scalable normative change interventions focused on adolescent/youth sexual and reproductive health outcomes. Aiming to encourage more cross-sectoral discussions and exploration of the issues and practical ways to think about them, the workshop created a space for discussion on norms-focused interventions and highlighted several participatory exercises used to learn how communities understand norms relating to specific health behaviors. Advocacy is a platform to create movement toward both greater political and social commitment to an issue in a country. It engages stakeholders by using a participatory and consensus-building approach toward a shared vision at national and subnational levels. A central focus of advocacy for healthier communities is promoting accountability and strengthening governance. For example, advocacy can support development of a policy, investment of resources to strengthen and expand implementation of services, and coordination between government and nongovernmental organizations. By examining the context of the situation and tailoring advocacy needs, advocates can be more effective in igniting change and making strides toward healthier communities. This interactive half-day workshop drew from work of the USAID-funded Food and Nutrition Technical Assistance III (FANTA) Project, and provided participants with a greater understanding of how to plan for and conduct advocacy efforts at national and subnational levels. The Visualisation in Participatory Programmes (VIPP) methodology was used to engage participants who left the workshop with two tools – an advocacy plan template and ‘creative brief’ template for material planning. Guest panelists included representatives from U.S. Pharmacopeial Convention (USP) and Global Health Council. Those new to CORE Group, new to our conferences, or those wanting to learn more about us joined us at the Welcome & Orientation session. In addition to meeting fellow conference attendees, participants learned about the history and current work of CORE Group, what to expect at the conference, and how to get involved with our Working Groups, events, listservs, etc. We finished the day with a happy hour hosted by CORE Group’s Young Professionals Network! The happy hour was open to all for casual networking, meeting new people, and catching up with friends and colleagues. Scalability has long been a priority for public health practitioners. Governments, donors and target populations have sought to discourage the frequent piloting of programs that do not move beyond a small number of sites for sound economic and programmatic reasons. While scaling interventions of any kind can prove a challenge, social and behavior change (SBC) interventions are especially difficult to bring to scale due to their inherent context dependence. If sound SBC programming should be designed to fit local circumstance, this would seem to limit its ability to spread to sites that are invariably—and sometimes radically—different. The special challenge SBC faces in terms of scalability may be one reason why scale-up is frequently overlooked in our field, and when it is considered, it is rarely considered at the design stage. Presenters presented the formal and informal scale-up frameworks they have used as part of their program design and demonstrated how they have managed the practical challenges entailed in bringing SBC interventions to scale while maintaining their sensitivity to local realities. During this session, participants explored Early Childhood Development (ECD) implementation strategies and lessons learned from various countries. Panelists shared evaluation designs for ECD programs and communication strategies for engaging stakeholders integrating ECD interventions across sectors. A panel of five experts in integrated ECD programming and research discussed the science of ECD and entry points for ECD integration in the design of new projects or established community based platforms. 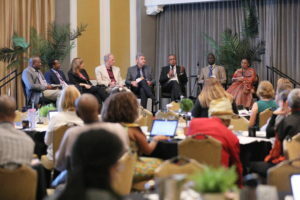 Panelists also shared evidence-based strategies from Sub-Saharan Africa and Armenia (similarities and differences), as well as lessons learned and gaps in current MCH and nutrition programs. Research experts shared the need for strong and detailed theory of change to align program staff and evaluators with target outcomes and intended impacts. They also discussed evaluation design practicalities to consider for ECD programs, and the importance of measuring fidelity of program implementation and individual level exposure. Lastly, they discussed experiences in randomized control trials in Cameroon, Kenya, Tanzania, and Armenia. The panel discussion included factors to consider in scaling up, including country readiness, donors’ focus, and how to influence public services. The Future of Integrated Community Case Management: Where Do We Go From Here? Community case management (CCM) and integrated community case management (iCCM) have been intervention strategies at the forefront of child survival in low-resource settings, utilizing the power of local human resource to provide more equitable and life-saving care to children in the hardest-to-reach places. This year marked five years since iCCM was formally endorsed by WHO and UNICEF. With post-MDG shifts in child health priorities, the role of iCCM within both the child health and community health fields is increasingly unclear. 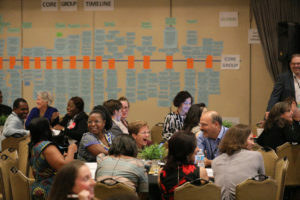 This session helped participants reflect on the directions iCCM programming can or should take, in the context of the “survive, thrive, and transform” agenda for children around the globe. This session highlighted experiences collaborating with governments to pilot and scale up nutrition services in Malawi and Nigeria. Speakers discussed how they were able to get buy-in from governments and collaborate to implement an improved approach to training and supervision of health workers and government extension workers; scale up a peer support group approach throughout communities; and integrate approaches into national, regional, and district-level health systems. Improvements in the utilization of nutrition services and overall nutritional impact were highlighted. Each experience shed light on lessons learned in collaborating with governments and how these might be useful for expansion of improved nutrition services into new areas. At this interactive meeting for CORE Group Members, we highlighted updates and opportunities at CORE Group. The meeting included a discussion on the nominations process for new Board members, a report from CORE Group Executive Director Lisa Hilmi, a discussion on 2018 conference themes and potential overseas conferences, the launch of the new CORE Group website, information on the CORE Group Young Professionals Network Mentorship program, and more. This was also an opportunity for CORE Group Members to bring topics forward for discussion. Over the past eighteen months, the Millennium Development Goals (MDGs) have expired, and the world has entered a new cycle of global targets, the Sustainable Development Goals (SDGs). While significant health progress has been made over the life of the former, it is now clear that none of the three health goals have been met. In response, there is an emerging consensus among global health leaders that achieving universal health coverage will require building stronger health delivery systems, with particular emphasis on community-based primary health care. To harness the potential of community health workers (CHWs) to extend health services to poor and marginalized populations and avoid the pitfalls of the post-Alma Ata period, there is an urgent need to better understand how CHW programs can be optimized. The WHO aims to fill this normative vacuum through the development of new guidelines on health policy and system support to optimize CHW programs. Recommendations will be developed in line with evidence-based practice, using the findings from a series of systematic reviews. Existing evidence, however, indicates that for many of the elements identified as critical to the success of CHW programs (e.g. training, supervision), studies provide insufficient operational detail. As a result, it remains necessary to further define how to effectively design and implement these elements of CHW-led health care delivery in practice. This panel, composed of speakers from the CHW Coalition, introduced and widened early efforts to synthesize practitioner expertise with the aim of developing operational guidance to accompany the new WHO guidelines. Research shows that when women and men are able to space their children, then entire families, communities, and societies benefit. However, 214 million women want to prevent pregnancy, but are not using a modern method of family planning (FP). Literature shows that social norms, fear of side effects, and low perceived risk of pregnancy are key barriers to FP use. While many have attempted to address cultural resistance and access barriers, less has been done on addressing perceptions of pregnancy risk. Modest improvements in body literacy and fertility awareness can contribute to safer sexual relationships, pregnancy prevention, and improved menstrual hygiene management. Integrating fertility awareness into multi-sectoral programs can improve FP acceptance while also providing mutually beneficial outcomes to other development areas. This session shared how the Institute of Reproductive Health at Georgetown University and Save the Children partnered to develop and test a series of low-cost, community-based interventions that can be integrated into multi-sectoral projects. The objectives of these interventions are to address both low perceived pregnancy risks and social normative barriers to family planning use. The solutions are based on extensive, user-centered formative research of local cultural beliefs and can fit easily into existing community-based programming, regardless of the sector. The approaches and indicators that are currently available for strengthening infant and young child feeding (IYCF) have traditionally focused on supporting breastfeeding practices and increasing the frequency and diversity of complementary meals. Yet other key recommendations for feeding young children receive less emphasis, such as WHO guidance on responsive feeding, the safe preparation and storage of foods, and the amount and consistency of foods given. In this session, participants learned about recent work to test interventions, guidance, and monitoring tools to improve these aspects of IYCF, including: (a) An operations research study from Concern Worldwide to increase the quantity and consistency of complementary foods using a feeding bowl and slotted spoon in Malawi ; (b) The recently released Essential WASH Actions guidance from FHI 360 as a tool to improve the integration of WASH within IYCF interventions; and (c) The use of community video and a child feeding questionnaire from SPRING to influence and measure responsive feeding practices in the Sahel. In discussion, participants explored the challenges and limitations that projects have faced, their recommendations for overcoming these, and the implementation and monitoring tools needed to further test and scale up new IYCF approaches. Throughout the world, people with intellectual disabilities (ID) are a forgotten population when it comes to access to and quality of healthcare they receive. Many of the up to 200 million people with ID globally face highly elevated risk of isolation, stigma, physical abuse, poverty, and lack of access to services and information – all compounding to create gross disparities in terms of their health status and basic protections. In countries around the world, people with ID are consistently the most marginalized population subset – a status that comes with horrific health outcomes. This session covered health service barriers for this population; discussed how serving people with disabilities is essential to reaching the Sustainable Development Goals and Universal Health Coverage; provided an example of a successful Early Childhood Development model expanding access to health services for children with ID through a partnership between Catholic Relief Services and Special Olympics in Kenya; and gave organizations the opportunity to dialogue about how to make their work more inclusive. In this opening day plenary, we brought the history of CORE Group to life. Brief presentations, designed to share major CORE Group achievements such as the iCCM story and the PD/Hearth story, were followed by an “open mic” session where participants had the chance to share their own stories and experiences. A tabletop trivia game was played to highlight key CORE Group tools. 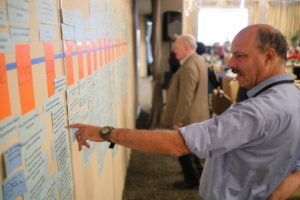 We also launched the CORE Group Timeline, and participants were invited to contribute their own individual, organizational, and team milestones to the overall timeline throughout the rest of the conference. The CORE Group Polio Project (CGPP) provided an overview of the lessons learned from the polio eradication project with an emphasis on how they could be of value across a variety of maternal and child health projects. We shared our experiences from the past 18 years and how they can be best applied to other health initiatives through discussions of CGPP country initiatives such as the non-traditional consortium and collaborative model, evolution of communication strategy, innovations, and relevance to other infectious diseases. When the project started in 1999, polio was still endemic in dozens of countries with thousands of cases annually. Through the dedication and hard work of the CORE Group Polio Project, the Global Polio Eradication Initiative, and thousands of volunteers, polio was reduced to three endemic countries and only 37 total cases in 2016 and no new cases so far in 2017. The project today works in India, Ethiopia, South Sudan, Kenya, Somalia and Nigeria through more than 50 international and national NGOs, along with relevant host-country ministries and international stakeholders, including Rotary International, UNICEF, WHO, CDC, and the Bill and Melinda Gates Foundation. Starting with the upcoming MCSP publication “Beyond the Building Blocks (BBB): How health systems must address community health to improve maternal, newborn and child health,” participants engaged with the recommendations made to policymakers by the BBB paper through practical examples from field and global professionals. Through presentations and dialogue, we focused on the importance of community organizations and societal partnerships for health systems strengthening, and we collaborated to articulate key messages related to community health investment for policymakers and other health system stakeholders. The session deepened understanding of the importance of elements currently missing in dominant health systems models for advancing community-centered health systems strengthening. It engaged diverse stakeholders in an effort to unite behind a common voice for health systems change. At the beginning of the session, facilitators presented an overview of active implementation frameworks and explained the Hexagon tool as a way to improve implementation design and planning using a specific example. The facilitators presented three different maternal health challenges using real data, taken from a small rural area in the south of Iraq, where one of the presenters provided MCH services at a local health facility. Small groups had the opportunity to use the Hexagon to analyze an assigned dilemma and make a final decision. The groups used the information provided to explore needs, fit, resource availability, evidence, readiness, and capacity to implement new programs. After completing their group challenges, participants reported back to the larger group on the decisions they reached about the feasibility of their program, the justifications for their decisions, and the insights they gained during the process to best shape their interventions for impact and sustainability. A high percentage of children with disabilities face a plethora of barriers that prevent them from realizing their full potential, including access to education, health care, social integration, and proper nutrition. Despite that, disability is often ignored and not included in global health programs, and children with disabilities are often not counted. In an effort to promote inclusion, disability needs to be part of the DNA of every project and program and not talked about separately. This interactive session engaged participants in a discussion around how we understand disability; the intersection between nutrition, feeding and disability; and reasons for poor inclusion of children with disabilities into mainstream nutrition and feeding programs. Speakers shared experiences from their work in the field, presented on existing tools and resources, and facilitated a discussion and group activities around ways to increase linkages with disability-related programming and how to make sure disability is represented across programs. Despite a wealth of evidence regarding effective clinical approaches to diagnosing and treating non-communicable diseases (NCDs), morbidity and mortality rates for these illnesses are rising globally, particularly among underserved populations in low-resource settings. A key reason for this paradox is that patients face both demand- and supply-side barriers to accessing chronic care services in their local communities. This session focused on the private sector’s role in expanding access to NCD services. Our three panelists and moderator presented different perspectives on the nexus of the private sector and NCD service delivery (implementer, donor, evaluator) followed by a facilitated panel discussion on how private sector engagement, support, and financing affects NCD programming and services. At this session, we announced the pilot YPN Mentorship Program! This informational lunch table provided information on the program and mentor or mentee applications. This session examined strategies for prevention, early identification, treatment, and ongoing management of chronic diseases in low-resource settings. The two organizations briefly presented recent work to develop training materials for community health workers to more effectively engage in screening, referral and support for cancer, diabetes and heart disease; and community outreach, screening and treatment for breast cancer in Haiti. Sarah Shannon provided examples and summarized new training materials on NCDs (cancer, diabetes, and heart disease) developed with primary care organizations and community health workers. These materials have been translated into many languages. Bette Gebrian and Judy Lewis identifed key issues and challenges in developing a public-private partnership to improve all aspects of community level breast cancer services: community awareness, clinical screening, sonography, biopsy and histology, and treatment for low-income rural women in the Grand Anse. The brief presentations identified some key issues for discussion. Round-table participants brought their own experiences with chronic diseases in community settings. These were used to develop strategies to improve community-level interventions. A Learning and Practice Alliance for Advocacy (LPAA) is a platform that brings together multiple stakeholders working in one sector to conduct joint action research in order to inform future advocacy and practices. The LPAA model is a collaboration of stakeholders from local to national levels, including government, research institutions, and other non-governmental organizations. The stakeholders define an emerging issue of common interest to conduct research resulting in a joint advocacy plan. Stakeholders remain engaged, providing a forum for active capacity building, intentional learning, rapid uptake of innovations, and engagement in advocacy at multiple levels. New findings from an LPAA initiative form the basis for learning among stakeholders, targeted groups and partners, and inform policy development and implementation. 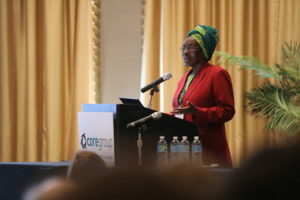 CARE has used Learning and Practice Alliance for Advocacy platforms to coordinate and leverage research, learning best practices to influence government policy and strategies for nutrition, health, water, sanitation and hygiene. This table succinctly introduced participants to IRC’s new, tangible Color-Coded Health Calendar tool which was recently assessed by the London School of Hygiene and Tropical Medicine through a rigorous mixed-methods evaluation. This tool is distributed by community-based health workers to pregnant women to hang in their homes and aims to increase use of antenatal care, skilled delivery, postnatal care, immunization and postpartum family planning services. The tool is an informational, educational, and communications material for all health decision-making members of the household as well as a job aid for community-based health workers [known in Ethiopia as two distinct cadres: Health Extension Workers (HEWs) and Health Development Army (HDAs) Members]. The TOPS Program and CARE introduced a new resource, “Realize: Social and Behavioral Change for Gender Equity and Diversity (SBC for GED)”. The aim of this user-friendly facilitation guide is to build awareness, facilitate dialogue, and explore potential action to improve gender equity and diversity among development staff and community members, and to identify the juncture of SBC and GED within multiple contexts to increase their impact. The activities are designed to be experiential, to encourage new thought and communication patterns, and to motivate change in gender norms (and other types of societal norms) that impede success of multi-sectoral programming. As more social, economic, and health-related spatial data are made available through DHS and similar programs, GIS becomes a more relevant tool to global health and development work. Building on previous work looking at access to maternal health services based on physical barriers in the Nigerian states of Ebonyi and Kogi, current work uses GIS to understand social-economic and other non-physical barriers in the same states. This project uses surface raster layers produced from WorldPop and the Demographic and Health Survey (DHS) Spatial Data Repository along with a dataset from a study on accessibility to Basic and Comprehensive Emergency Obstetric and Neonatal Care (BEmONC/CEmONC). For years, global health programs have sought to strengthen the capacity of organizations and systems. An ongoing challenge is selecting appropriate ways to measure the success of such efforts. Conventional evaluation approaches often fall short in capturing a complete picture of change in complex global health programs, especially those that involve organizations and systems. In 2013, USAID named Outcome Harvesting (OH) —a participatory qualitatative methodology— as one of several innovative complexity-aware monitoring and evaluation methods. The USAID-funded global project, Health Communication Capacity Collaborative (HC3) implemented OH in three countries (Ethiopia, Bangladesh, Liberia) to evaluate capacity strengthening activities for improved social and behavior change. By the end of the presentation, participants could identify global health programs for which OH is especially well-suited. Looking to help partners in low- and middle-income countries gather stronger impact data through lean strategies? 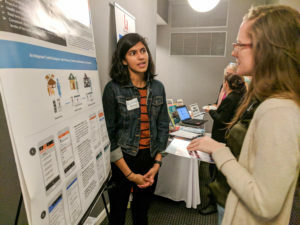 The Duke Global Health Institute Evidence Lab developed an evaluation toolkit, with new tools released in 2017, to help social enterprises in healthcare evaluate their services, products and/or technologies. Most social enterprises work in low-resource contexts where they lack the requirements for rigorous, gold-standard evaluations: finances, time to observe changes, and a controlled environment. The toolkit outlines different ways social enterprises in health can better evaluate their work and communicate their results with tighter timelines and more limited resources. New tools released this year focus on strengthening access and quality of care patient data, leveraging data for expansion, and identifying an appropriate economic analysis to assess impact. This table discussed a study conducted to map the catchment areas of the comprehensive HIV care and treatment facilities in the scale-up sub national units (SNUs) in Nigeria. The study purpose was to determine whether community-based orphans and vulnerable children (OVC) programs are being appropriately located and if not, estimate a measure for the targeting misalignment. The study sampled 26,365 caseloads and revealed that 27.5% of all clients sampled access services outside of their LGAs of residence. The study highlighted the importance of linking adherence statistics with catchment data to inform epidemic control programming. It also revealed existing and potential challenges for the continuum of care in identifying people living with HIV and effectively linking them to treatment. Evidence from this study has been applied by PEPFAR to influence future programming in Nigeria. PEPFAR has reviewed boundaries for community-based HIV services to better align community OVC activities to comprehensive HIV treatment, care and support facilities. Given the combination of stigma and discrimination faced by people living with HIV (PLHIV), and economic barriers to seeking routine antiretroviral therapy (ART), adherence can be a struggle for some. This table introduced the structural barriers to ART adherence in El Salvador, Guatemala, Honduras, and Panama, and described the work and results of IntraHealth’s Adherence Promotors and Community Liaisons, which have achieved a return rate of 42 – 45% for patients who have abandoned ART treatment. The host discussed the differences in recovering PLHIV who are only at risk of abandonment and those who are classified as having abandoned ART, and the advantages of phone calls vs. home visits. Discussion included personal experiences of Adherence Promoters and Community Liaisons; what made them want to perform this type of work, their best and worst days, and their suggestions for improving the intervention. Participants also shared their own experiences with ART adherence interventions. Indigenous rural populations around the world face inequitable childbirth outcomes, and women continue to deliver and die in their homes without timely access to emergency obstetric care. The Casa Materna Rural model, with its community ownership, task-shifting, and demand-generating household-level outreach, represents a low-cost alternative, proven to be effective in reducing maternal and neonatal mortality in hard-to-reach populations. In the Casa catchments areas in Guatemala, coverage of health facility deliveries has increased from 16% to 70%, maternal mortality has been eliminated, and Casa staff have successfully managed by resolution or referral over 300 obstetric complications. Sustainability is built into the model through community-ownership and collaboration and cost-sharing with the Ministry of Health, local municipal government, civil society, and communities. As a result of cost-sharing, high utilization, and task shifting, Casa deliveries cost 1/10 that of government health facility deliveries. The model provides a promising approach to increasing facility-based deliveries at low cost in low-resource rural regions around the world. This table introduced a High Impact Practices in Family Planning (HIPs) brief, which presents evidence-based best practices in community group engagement interventions that aim to foster healthy sexual and reproductive health behaviors. Community support can shift individual behavior, including contraceptive behaviors, either by changing norms or individual knowledge and attitudes. This brief identifies key practices, outlines why they are important, presents the challenges the practice can address, summarizes the evidence of impact, offers implementation tips, and provides tools and resources. This 8-page HIPs brief is available in English, Spanish, Portuguese, and French. In Sunamganj, an underserved, remote area of rural Bangladesh, an acute shortage of qualified government health workers creates an environment where women are burdened with high costs for poor quality maternal and child health services from unskilled providers. To address these key challenges, CARE, with funding from GlaxoSmithKline’s 20% profit reinvestment initiative, established an innovative cadre of private community-based skilled birth attendants (CSBA) in partnership with the Government of Bangladesh. 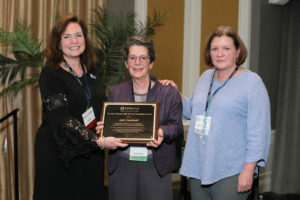 Unlike previous attempts to build a cadre of CSBAs, CARE developed a sustainable, market-driven solution by ensuring providers were selected, connected, and supported by the community, the public health system and local government; linked to existing public health service providers for supportive supervision, supplies and information management; and trained in business skills and entrepreneurship. At this table, we described the model, share preliminary evaluation results, and discuss challenges and lessons learned. Community Health Workers (CHWs) can play a critical role in supporting early identification of eye problems and quickly referring those who need it for higher level care and surgical intervention. Despite great potential, almost no training materials exist to support CHW training on these issues. Hesperian shared the field test version and CHW feedback on a new module on eye health that provides accessible, clear information that will enable CHWs to: identify eye and vision problems; refer those who can be treated with corrective lenses or surgery; recognize and respond to eye injuries; and integrate eye health education and promotion into their outreach and communication with community members. The draft module is now in the hands of community partners in Tanzania, Nigeria, Belize, India, and other countries and, when completed, will be translated into Bangla, Chinese, French, Khmer, Lao, Nepali, Portuguese, and Spanish. Community Health Academy (CHA) is a new global platform to train, empower and connect Community Health Workers (CHWs) in every corner of the world. Founded by the 2017 TED Prize winner, the CHA aims to reinvent the education of CHWs and the leaders who support them for the digital age. The Community Health Academy will provide continuing professional education for community health policymakers and managers, creating opportunities to learn, inform, and apply best practices to the design and management of CHW programs through Open Online Courses co-produced with HarvardX, engagement in online communities of practice, and in-country technical assistance. 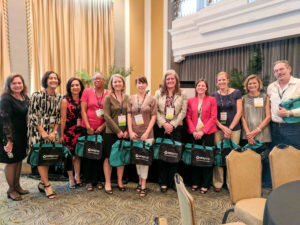 CHA opens new pathways for Continuing Medical Education and Accreditation for CHWs, powered by innovative performance management strategies and mobile health technologies. CHA seeks to support and engage the CORE Group community in building and teaching a body of best-practice knowledge related to CHW programming. Many young people around the world face unique barriers to finding quality family planning (FP) information and accessing services, especially when it comes to long-acting reversible contraceptives (LARCs). To bridge this knowledge gap, the Health Communication Capacity Collaborative (HC3) developed the FP INFOcus Guide, which encourages youth-led organizations to create short videos featuring authentic voices and perspectives about FP from their own communities – all using their mobile phones. The Guide includes a step-by-step approach to preparing, producing and promoting videos that share FP information and model essential sexual and reproductive health skills. The Guide was tested with a youth-focused, youth-led Nigerian organization, the HACEY Health Initiative. At this table, participants watched the videos they created, and learned the best practices for digital storytelling and how this approach can be integrated into your own work. The CORE Group Nutrition Working Group unveiled and discussed a new reference guide highlighting key nutrition-specific tools and approaches with information on how and when to use them. The reference guide informs selection of the most appropriate design, implementation, research, and monitoring and evaluation tools for nutrition activities worldwide. This guide is primarily targeted to nutrition program developers, managers, researchers, and others working in global nutrition. It is also applicable to those working on multisectoral programming. During this working group time, we rolled up our sleeves and focused on two priority areas. In small groups, we discussed outcomes and continued conversation from the concurrent session, “Moving Beyond the Building Blocks: Guiding Policymakers toward Community Health Investments to Strengthen Health Systems.” Also, we planned for the Health System Research Symposium 2018 by developing content for a concurrent session. In an effort to use our time efficiently, participants reviewed their evidence base and came prepared with abstracts and content to share with other group members based on the following two focal areas: community health systems – where community needs are located, but often where national health systems are inadequate or invisible; and leaving no one behind – health systems that deliver for all. We enjoyed seeing everyone and welcoming new members! The mission of the M&E Working Group is to develop, nurture and disseminate approaches to use data to improve community health programming and demonstrate its effectiveness to stakeholders. At this year’s Fall Conference, we did some self-evaluation – taking stock of how we are fulfilling that mission and how we could more fully engage global community health practitioners in using data to do better work. We invited M&E specialists who know what specific skill sets need development; programmers who want M&E specialists to translate from M&E-ese into the many other languages we speak; and decision-makers who want data to make sense and be tied to action steps. We generated foundations of a new and updated 2017-18 workplan as the primary output of our time. Members of the RMNAH Working Group provided input to a dynamic and collaborative team. The RMNAH Working Group synthesizes current research, best practices, and community health experience to establish a platform to discuss priority issues pertaining to maternal, newborn, and adolescent health. We used this planning session to define activities and priority deliverables for the coming year. The Social and Behavior Change Working Group discussed various efforts that the group is planning to achieve based on the brainstorming session held during the Spring 2017 Conference. We also began gathering ideas for this year’s work plan. Finally, a few colleagues led short presentations on their current work. The Nutrition Working Group highlighted various efforts that the group is working to achieve! Working group efforts focus on the double burden of malnutrition, the Essential Nutrition Actions framework, CMAM/CCM integration, nutrition-sensitive integration, multi-sectoral anemia, and a technical webinar series. We gathered ideas for the work plan and the Spring 2018 Conference. Finally, we took a few moments to recognize a few of our consistent member contributors. The Nutrition Working Group time ended at 5:00pm on Wednesday. On Thursday, there was a presentation and discussion on obesity and NCDs at lunch time, and Working Group members were encouraged to attend. An estimated 17 million children are currently affected by severe acute malnutrition (SAM) worldwide, with the current food insecurity and famine crisis placing even greater pressure on the global nutrition community to respond. Children experiencing SAM have significantly higher risk of mortality, and many of these children face major barriers to care, such as distance to the nearest therapeutic center. To alleviate this burden, several organizations have explored the feasibility of adopting a community health worker delivery model for treatment of SAM. Action Against Hunger has tested this delivery model in Mali and Pakistan, and the International Rescue Committee has done so in South Sudan, focusing specifically on low-literate cadres of community health workers. In addition to innovations in treatment delivery, decentralization of screening down to the household level has also been considered to inspire early careseeking. The Alliance for International Medical Action tested in Niger the effectiveness of training families to use the MUAC tape and check for edema. This session presented new evidence from these projects that are exploring the potential to bring care for acute malnutrition closer to the home, and will reflect on the challenges that remain in scaling up such strategies. From Hans Rosling to community chalkboards, example abound of how much more data can mean with simple, clear, creative presentation. Increasingly, we are being asked to use data to drive decision making and real-time program improvement, but we frequently present data to appeal to people’s rational, analytical sides and are surprised when they don’t immediately take action. This session looked at how to share data that motivates behavior change – by connecting with people’s emotions and creating a sense of urgency. Alive and Thrive shared how they used data on child malnutrition to motivate Orthodox priests to encourage dietary diversity in young children even when parents were fasting. The Manoff Group shared three examples of data application which resulted in significant improvements in health and nutrition behaviors and strengthened community systems. The examples showed the program context, the use of the tools by communities, and the health and nutrition outcomes. We looked at these examples through the perspectives and reflections of health workers in Honduras, community volunteers in Zambia, and local leaders in Cambodia, emphasizing insights into the elements that elicit emotional responses and resulting individual and collective actions. The session presented a few basic principles about behavior change and using data, shared examples from projects that used data for behavior change (Alive and Thrive/The Manoff Group) and then offered participants a chance to work in small groups to “Stump the Chump” (find a better way to illustrate sample findings/messages than the examples discussed). This session provided strategies to widely promote and publicize a project’s work, including history and accomplishments, by contributing to scientific literature in a timely manner. At the time of this session, the CORE Group Polio Project was preparing a journal supplement about community-based approaches to polio eradication in the highly respected American Journal of Tropical Medicine and Hygiene, which is open access and peer reviewed. The goal of the series of articles is to explore the project’s position as a civil society coalition working at the community level. They were working closely with about ten authors from the field, who are expected to produce first drafts by late 2017 (with tentative online publication scheduled in late spring 2018 and print publication in summer 2018). Some of the authors are front-line practitioners who have never published before, while others are researchers and academics who have published many times. As this is the project’s first attempt at a journal supplement with hopes of producing a similar publication again, we shared our limited experiences and learned more from other’s efforts to publish. We reviewed our process from developing RFPs, establishing a small review committee to select authors, choosing a journal, refining the research questions, understanding the editorial needs of the publisher, etc. We plan to address the adjustments we’ve made in response to certain challenges, such as establishing staggered timelines for writers with different skillsets or hiring a graduate student researcher to assist with literature searches when authors do not have access to journal articles. The need for flexibility and creativity was stressed. Worldwide, non-communicable diseases (NCDs) are responsible annually for approximately two-thirds of all deaths and are a leading cause of premature death and disability. NCDs and their behavioral risk factors pose a major roadblock to achieving sustainable development goals. Current efforts to address NCDs focus on a four-by-four matrix comprised of the four chronic conditions that result in the greatest morbidity and mortality (heart disease, cancers, diabetes, and chronic lung disease) and the four major associated risk factors (tobacco use, physical inactivity, unhealthy diet, and harmful use of alcohol). This session explored programs where NCD management has been integrated into existing health service delivery platforms from three different perspectives: 1) Training frontline health workers, including CHWs, to conduct NCD prevention, screening, detection, and follow-up in their communities; 2) Integrating NCD prevention, screening, and follow-up into existing chronic care services (e.g. HIV/AIDS, TB, etc.) in humanitarian and non-humanitarian settings; and 3) Integrating NCD prevention, screening and follow-up into existing non-chronic health services, such as primary care systems and maternal, newborn, and child health. Session participants left with resources to share with colleagues, ideas to integrate NCD prevention, detection, and control into existing or planned programs, and awareness of challenges that lie ahead. LQAS is globally recognized as a method for monitoring and evaluating programs. Since 1998, it has been used by private voluntary organizations (PVOs), non-governmental organizations (NGOs), and increasingly by cooperating agencies and ministries of health for decentralized M&E and building local capacity. There is high demand for increasingly user-friendly tools to support the planning and use of LQAS at larger scale. This session reviewed a large product line of LQAS methods and tools and when to use each. It also inspected common misuses. Participants became familiar with the range of LQAS applications, including: Classic LQAS, Large Country (LC) LQAS, Health Facility Assessments, Multiple Classification (MC) LQAS for disease tracking, and Global Acute Malnutrition (GAM) LQAS. Participants learned how LC-LQAS is used to sample some, rather than all, Supervision Areas to obtain the coverage proportion for the catchment area. Participants heard how MC-LQAS is used to classify areas by the density of disease, and GAM LQAS is a rapid method for measuring severe malnutrition. They also heard about recent uses of LQAS to manage refugee camps and IDP settlements. Participants learned to use a new LQAS calculator and the UNICEF LQAS toolkit for planning purposes. Participants accessed LQAS training films and learn about their use for capacity building. The Nutrition Working Group showed a film and presentation from Dan Fenyvesi, a Registered Dietitian whose research centers around the growing obesity epidemic in the developing world. Working group members explored the cultural, social, and structural dynamics that are driving the rise of obesity in Nicaragua, through a short presentation and film. This was followed by a discussion on opportunities for incorporating prevention of obesity into existing programming, including “double-duty actions” to prevent multiple forms of malnutrition. We continued the discussions from Wednesday’s Working Group session on two priority areas – furthering conversation from the “Moving Beyond the Building Blocks: Guiding Policymakers toward Community Health Investments to Strengthen Health Systems” concurrent session, and planning for the Health System Research Symposium 2018. This session included an open discussion on current realities of various financing opportunities, future trends, and an increasing need for collaborative partnerships with local government and private sector in community health systems financing. Panelists presented their experiences with multi-lateral financing organizations, private philanthrophy, and different models of NGOs’ strategic partnerships with private sector donors. Additional discussions covered impact investments, corporate prioritization process, signature initiatives, and potential financing needs for community health systems in Sub Saharan Africa. Youth leadership will be increasingly important to strengthen health and development worldwide. Globally, there are approximately 1.8 billion youth, and the majority live in low-and middle- income countries. In several countries, over 50% of their population is under the age of 20, an indication that young people will remain critical to the success of many countries. This panel explored the ways that youth leadership is making a difference for both global and community health. Youth leaders described how their work with local initiatives and global health advocacy is creating sustainable opportunities for youth. New tools, such as PMNCH’s newly released guidance, Advocating for Change for Adolescents, were also discussed. In order to accomplish the ambitious objectives of the SDGs, a real paradigm shift is required. This session: 1) summarized the successes, failures, and key lessons learned from the implementation of child health interventions during the MDG era; 2) provided an overview of current opportunities for developing and implementing a more comprehensive program; and 3) discussed the remaining challenges and the way forward. Mr. Pfaffmann presented the lessons learned from the implementation of child health interventions globally and shared the current thinking. Dr. Bikorimana presented Rwanda’s approaches to iCCM, IMCI, ETAT and quality of care, and shared how the whole Government’s vision converges into the goal of improving citizen’s lives. Mr. Swedberg, Dr. Jodrey and Dr. Kasungami explored the opportunities and challenges from the perspectives of NGOs, funding agencies, and host governments, providing insights on current and future trends in funding. There is much interest in the role of civil society participation in national health program strengthening, from community participation to national budget advocacy. However, relatively little information is available to compare and contrast different ‘social accountability’ approaches. What resources are required? Which stakeholders are engaged? How are results measured and reported? What is the role of quality during implementation, and how does quality affect results and scale-up? This session examined the Community Score Card (CSC) as a promising approach that has been practiced for the past 15 years. The speakers described: CSC principles, practices, results, and the role of quality on overall effectiveness and sustainability. Questions were taken from participants following the presentations. How will CORE Group, members and partners address the changes in global technology, development and knowledge? Should we think about addressing inequality differently? What does the future require of us? If the SDGs are targeted to improve the lives of 10-year olds today, how do we ensure the meaningful participation of youth and engage new voices of the marginalized and vulnerable in the communities we serve? How do we communicate more effectively with donors and partners? What new tools do we need? What new thinking will be required? This session presented major global trends and challenges related to meeting the SDGs, including the lack of community-level indicators, the conflict between universal health care and reaching those furthest behind first, and the disconnect between global, regional, national, and local levels. This dynamic session included presentations by Dr. Schensul and Ms. Phaladi, both of whom have extensive experience with these issues, and started a dialogue about how we can begin to work in new ways to more effectively address the needs of communities, youth and marginalized groups. This was the start of an agenda for the next 20 years of CORE Group!